An undercover FBI agent gave Florida Democratic gubernatorial candidate Andrew Gillum tickets to a Broadway show, the Tampa Bay Times reported Tuesday, despite claims by his campaign that he received them from his brother. Records of text messages between Gillum, who’s currently Tallahassee’s mayor, and former lobbyist Adam Corey were given to the Florida Commission on Ethics amid an investigation into trips Gillum took to Costa Rica and New York in 2016. Corey’s lawyer, Chris Kise, released the records Tuesday, according to the Tampa Bay Times, just two weeks ahead of November’s election against former Republican Rep. Ron DeSantis. Gillum’s campaign released a statement on Sept. 4 claiming Gillum received tickets to the Broadway show “Hamilton” from his brother, Marcus Gillum. “After the trip, Mayor Gillum learned Marcus Gillum had obtained that ticket in a swap with Adam Corey for a concert ticket,” the statement reads. Contrary to this, the text messages show that Gillum knew the tickets came from “Mike Miller,” an undercover FBI agent investigating corruption in Tallahassee. “Mike Miller and the crew have tickets for us for Hamilton tonight at 8 p.m.,” Corey texted Gillum on Aug. 10, 2016, according to the Tampa Bay Times report. “Awesome news about Hamilton,” Gillum responded. Corey and Gillum have reportedly been friends since college until Gillum cut ties with him in 2017. 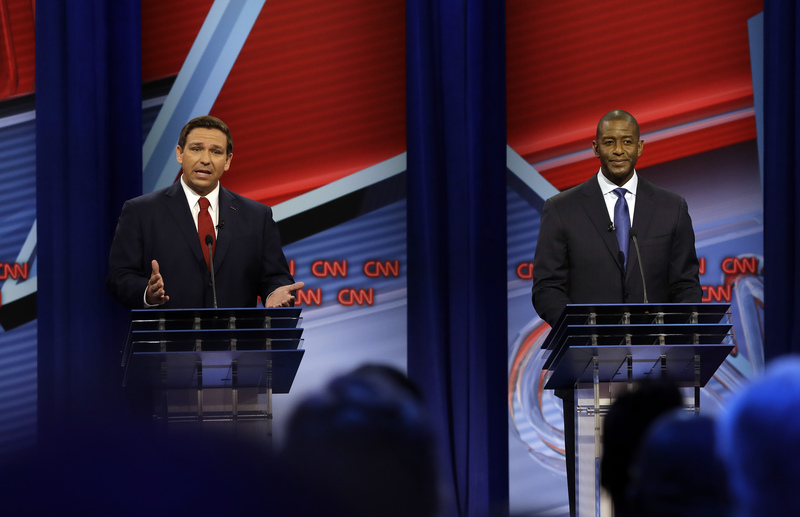 This ongoing federal investigation has followed Gillum throughout his campaign, and erupted again Sunday in the Florida gubernatorial debate with DeSantis. CNN anchor Jake Tapper, the debate’s moderator, pressed Gillum on the investigation, asking him specifically about his relationship with Corey. DeSantis also asked the mayor if he paid for the “Hamilton” tickets, which Gillum wouldn’t answer directly. “I know that may not fit your description of what you think people like me do, but I’ve worked hard for everything that I’ve gotten in my life,” he added. Corey’s lawyer said he was subpoenaed on Oct. 15 after an ethics complaint was filed against Gillum in June by Erwin Jackson, a local businessman. Florida’s ethics commission told Jackson the case would not be resolved before the election on Nov. 6. Requests for comment from Gillum’s campaign were not met in time for publication.